Coca-Cola’s Director of Supplier Sustainability, Ben Jordan, speaking on a panel at the U.S. Climate Action Center. Coca-Cola and UConn are part of the “We Are Still In” Coalition and Coke has contributed to UConn’s Campus Sustainability Fund in support of activities like the UConn@COP program. This was the third year for the UConn@COP program, and each year has been a distinctly different experience. We’ve traveled from the historic celebration of the Paris Agreement, which radiated great hope from the “City of Light” at COP21, to the post-U.S. election concerns, which cast a shadow over COP22 in Morocco. Now, it was onto Bonn in 2017, under a cloud of disappointment and uncertainty about how the Trump Administration’s announced plans to withdraw from the Paris Agreement would affect international progress on climate action. One way or another, COP23 would also be pivotal to the future of the UConn@COP program. A huge difference about COP23, and one that frankly salvaged our group’s overall experience in Bonn, was the presence of hundreds, if not thousands, of representatives from the “We are Still In” (WASI) coalition of U.S. businesses, state and municipal governments, NGOs and higher education. With no public “Green Zone” as part of the UN’s formal COP23 proceedings, we instead relied on side events, some of which were highly impactful (see our previous blog set Climate Justice and Solidarity). We also leaned heavily on the three days of WASI-organized programming held in the U.S. Climate Action Center (USCAC). A remarkable aspect of the WASI coalition’s determined presence at COP23, was its righteous representation of the sheer economic and political power that remains fully engaged in climate action here in the U.S. and around the world. After all, the combined purchasing power of the WASI coalition, at $6.2 trillion dollars annually, is nearly half the Gross Domestic Product of the U.S. If this “Made in America” public-private coalition were a nation unto itself, it would be the third largest economy in the world! 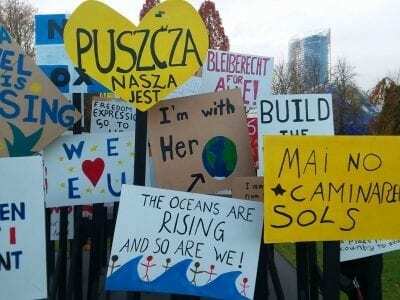 Despite WASI’s unofficial UN status as a sub-national entity, it proved at COP23 that it can nonetheless be a powerful voice for global leadership on climate action. Unlike our experiences at previous COPs, the executives speaking from the panels and lecterns at the USCAC weren’t representing just the obligatory green businesses and b-corporations, but included some of America’s largest companies, which own and operate manufacturing and distribution facilities all around the world. Make no mistake, these are companies that can drive the global transition to clean energy through best practices and more sustainable operations. They can also ensure the success of thousands of smaller green businesses, which provide essential goods and services to them, through their sustainable supply chain standards and procurement policies. 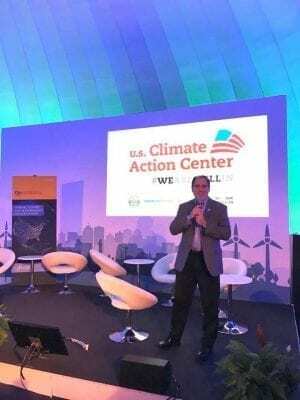 Director of the UConn OEP, Rich Miller, representing UConn at the Colleges United for Climate Action networking event (co-hosted by UConn, Second Nature, AASHE, and Tufts) in Bonn. It was reassuring and inspiring to see these U.S. based mega-companies, along with a number of state governors, city mayors and college presidents, stepping up at COP23 to fill a leadership void created by the Trump Administration’s step backwards. I enjoyed hearing from chief sustainability officers (CSOs) at companies like Coca-Cola, Wal-Mart, Microsoft, Mars, Ingersoll Rand and Patagonia, talking about progress in reducing greenhouse gas emissions from their own operations and supply chains. It was obvious to me that their corporate CEOs and investors firmly believe that strong environmental performance is good for their brand and their business, and not just a matter of compliance with laws, regulations or international treaties. I realized too, watching and learning from many of the WASI panelists at COP23, that the corporate CSO’s job is not that different from my own as UConn’s sustainability director (substituting sustainability-related academic metrics for the profit motive, of course). Even in academia, a good business case, such as cost savings, bolsters the likelihood of success for any sustainability initiative advanced by my office. Likewise, building UConn’s reputation for sustainability and environmental stewardship, helps attract and retain the best and brightest students, faculty and staff to the University, just as a company’s strong brand for climate leadership attracts consumers. 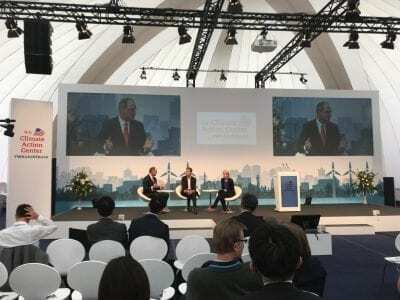 Todd Stern, former Special Envoy for Climate Change for the Obama Administration, summed up the challenge in his remarks toward the end of COP23: Can we transform the economy quickly enough to avoid the catastrophic impacts of climate change? This dilemma stresses the urgency for businesses to take on a larger percentage of the U.S., as well as the global, effort in combatting climate change. The challenge now is to capitalize on the benefits of areas like the renewable energy market and closed loop systems. Additionally, we need to develop more accurate models for predicting the cost associated with not implementing risk mitigation techniques meant to help curb our changing climate. It has been mentioned numerous times throughout the week that if we can figure out how to measure the cost, we can then figure out a way to implement it into the decision-making process. There are examples of businesses that have already started to factor this into their decision-making. In a panel earlier in the week hosted by the Center for Climate and Energy Solutions (C2ES), business leaders from a range of sectors discussed ways their companies have been on the forefront of implementing environmentally sustainable practices within their supply chains. David Eichberg, Sustainability and Social Innovations Lead for HP, explained how there has recently been a branching off of corporate environmental responsibility (CER) from the more commonly known practice of corporate social responsibility (CSR). Specifically at HP, they have implemented environmental scorecards, which feed into annual supplier scorecards (a multi factor rating of how “good” a supplier is). Now, when a supplier is more environmentally friendly it can boost their score by 10% and conversely, if they are not participating in environmentally friendly practices, their score stands to be reduced by up to 50%. Perhaps my biggest take away from COP23 so far has been that policy takes time. When looking at how long agreements between countries can take (there were many previous attempts that lead to the formatting of the Paris Climate Agreement) it is easy to see that efforts in other areas have to be made if we want to win this “race.” U.S. businesses can make a huge statement because they represent such a large portion of the economy. A great example of this is the more than 1700 businesses that have signed the “We Are Still In” pledge, where they are committing to uphold the targets of the Paris Climate Agreement. Persistence such as this will help us continue to pull our weight in global effort to reduce climate change. Climate change and business are inevitably intertwined. The fossil fuel industry has propagated and profited off environmental degradation for years, aiding companies in all sectors to increase profit margins and dodge social accountability. This year at COP23 in Bonn, Germany, business is playing a new role on the other side of the equation. Among local and academic leaders, American companies forged their own place in the UN climate conference, funding a US Climate Action Center adjacent to the Fiji-hosted pavilions. 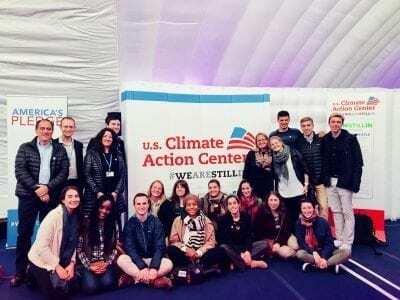 The US tent, nicknamed ‘WASI’ after its #WeAreStillIn slogan, represents organizations, politicians, and companies that have committed to the Paris Agreement goals in light of President Trump’s announced withdrawal this past June. 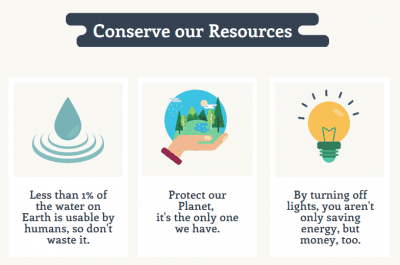 Big brands like HP, Target, Coca Cola, Walmart, Microsoft, and Mars are spotlighted as they debut green initiatives on sustainability, renewable energy, and ethical investing. Federal silence on climate action has given way to an astonishing level of corporate social activism. 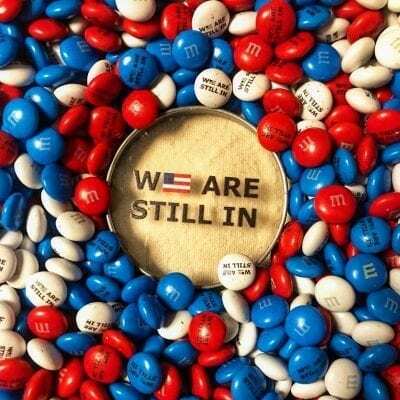 However, between the “We Are Still In” printed tote bags and specialty m&m’s, the back patting seems a bit premature. Conversations in the WASI tent are narrowly curated to feature businesses as lead protagonists in the fight against climate change, sidelining other key voices in the discussion. The predominantly white businessmen-dominated discussions curtail critiques on gender, colonialism, and classism that affect the core of climate change. Focusing on business leaders limits the conversation of climate solutions to corporate actions. Many of the talks hosted by the WASI tent focused on economic incentives and the profitability of sustainability instead of policy reforms and targeted research. This allows companies to control the terms of climate reforms to minimize damages on their business. NGOs and public institutions that often call out corporate conduct are marginalized in these climate discussions where they should be highlighted. The WASI events lack representation from indigenous groups, Small Island Developing States (SIDS), racial minorities, and other communities disproportionately vulnerable to climate change effects. Secondarily, business-centric dialogue amplifies the voice of the private sector in government, where corporate lobbying already plays a dominant role. Governor Kate Brown (OR) took time from her interview to commend Nike (headquartered in Oregon) for “working everyday to reduce their carbon footprint.” Brown, as well as representatives from Hawaii, Minnesota, and California focused their panel presentations on policies that engage manufacturing industries, support renewable energy companies, and (most importantly) create jobs. Catering local policies to business interests, as well as narrowing dialogue to economics, leaves space for company interests to take center stage. All this being said, the companies member to the We Are Still In coalition at COP23 have undoubtedly displayed incredible leadership on climate change where the government has stepped back. Their level of corporate activism is in many ways unprecedented, and greatly applauded by the international community. This is the first time I’ve heard a multinational corporation highlight local agriculture, sustainable supply chains, or habitat preservation. However, in this acknowledgement, critique is also warranted. Problems arise when the private sector is empowered and even encouraged to play a center role in social activism. The core of any business is to manifest and increase profit. We cannot ignore capitalist structures when amplifying corporate voices, especially when consumerism fueled global warming in the first place. It is additionally problematic to overlook widespread green-washing, where businesses often fund sustainable campaigns like #WeAreStillIn while simultaneously engaging in climate damaging practices. Businesses have an important role to play in the fight against climate change, but that role is not center stage. Local representatives, NGOs, and communities disparately affected by climate damages should be principal voices in the discussion, especially at events like COP23. It’s time to redirect power from profit-driven companies to people who fight and have always fought on the frontlines of climate justice. The Future of Green Finance: How can Wall Street create a more sustainable economy? Business leaders from the top global banks joined each other on stage to discuss their responsibility in the financing of green investments and the role their institutions need to play in financing an energy transformation. Anne Kelly moderated this panel that was made up of Michael Wilkins, Managing Director, Global Envrionmental & Climate Risk Research, S&P Global Ratings; Abyd Karmali, Managing Director, Climate Finance, Bank of America Merill Lynch; Val Smith, Director and Global Head, Corporate Sustainability, Citi; and, Erin Robert, Exectuive Director, Sustainable Finance, JPMorgan Chase. All of the business leaders were quick to acknowledge the role of human factors in climate change, but the conversation pivoted to discussing how to move forward to mitigate the risks of climate change and change our energy sources from fossil fuels to renewable energy. The financial industry has begun to make more and more investments into sustainable companies, such as wind farms and solar panel companies. When looking at these investments instead of traditional companies the difference of returns are immaterial, just a few bases points. Although the banks are not maximizing their returns, there is a social return for being environmentally conscious and investing in sustainable companies. The banks are still able to make sizeable returns on their investments, while moving the world towards more sustainable energy choices. Many of the banks represented at the panel have created green and environmental finance divisions, which are tasked with evaluating the sustainability of investments and whether the cost of lesser financial returns is worth the benefit of social returns. However, all the banks believed the Federal government needs to lead the investment future. Karmali stated, “The public sector needs to use its capital to de-risk low carbon opportunities in emerging markets so we can bring in private capital and scale up”. As we progress further as a society we see an increased emphasis on investing in socially sustainable companies to move away from fossil fuels and transition to renewable energy. There is nothing more awkward than incorrect ideological association. Over a year after the election of our most recent President and his infamous declarations of climate denial, perhaps the most frustrating outcome has been the ideological association placed upon the American people. As the United States operates under a democracy, the internationally perceived status of climate change legitimacy in the U.S. has mirrored that of our President – even while its alignment could not be further from the truth for most Americans. I, along with 68% of Americans, believe in anthropogenic climate change. As a proud environmentalist with the hopes to dedicate her life to environmental justice, the ever-so accepted narrative of the American refusal to legitimize this fact has been frustrating. For so many, anthropogenic climate change is not just a distant fact, but a driver for action. And for me, the environment – its study, its appreciation, its protection – is my life. So you can probably understand my distress at the thought that some of the most fundamental scientific truths about climate change might be overshadowed due to incorrect ideological association. And upon my arrival at COP23, this consciousness – one of possible incorrect alignment – discouraged me. How would I be accepted in the COP space as a dedicated environmental activist if my very nationality as an American could disqualify me from such a categorization? Could it also potentially disqualify my UConn cohorts and other U.S. citizens here in Bonn? Or worse – could this perception be another barrier for those who aspire to stand up against environmental injustices around the world? Although these concerns raced through my mind during the weeks leading up to COP23, in the end, my interactions throughout this week at the U.N.’s Climate Summit in Bonn, Germany provided me with both a sense of relief and renewed inspiration. That’s because when I reflect, my cumulative experience at COP was more than just transformative. It was reaffirming. I have the unalienable right to be a member of the climate justice movement. While my initial discouragement about my reception in the COP space was, and continues to be, legitimate, I must never, EVER question my right to take space in this movement. Every single relationship to the environment is valid and necessary in making long-lasting, sustainable, socially and scientifically competent change. Every single voice is necessary to accurately redefine environmental action as a non-partisan one. 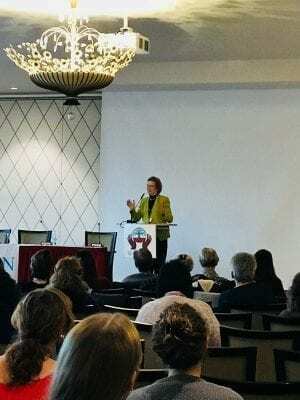 Mary Robinson, former President of Ireland and former United Nations High Commissioner for Human Rights speaking at the WECAN Conference. Photo taken by Sarah Munro. There is no time for the exclusion of voices in this movement. During her presentation at the Women’s Earth & Climate Action Network conference, Noelene Nabulivou, founder of DIVA for Equality FIJI and one of the most incredible people I have ever had the pleasure to meet, said it best. “We are in a social revolution, an economic revolution, an ecological revolution – because we have to be.” Climate change and adequate solutions must be appreciated in relation to every sector – social, economic, and ecological – as this appreciation will lead to understanding the interconnections and level of accountability that must be taken. The #WeAreStillIn movement represented this shared accountability, as it included voices that are not usually heard in the environmental movement – namely those of the private sector. In continuing to make the climate justice space inclusive, it must also be said that while all voices must be heard to create the most riveting changes, certain voices must be at the forefront of this movement. 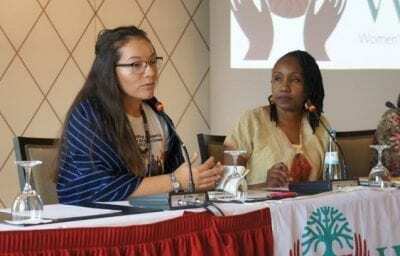 Women, specifically women of color and indigenous women, MUST be at the forefront of this movement, as they are simultaneously the most adversely impacted by environmental degradation. In this fact, it is this demographic that should be valued as indispensable actors and leaders of just and effective solutions. Finally, I realize that the takeaways I received from COP cannot and will not live in momentary appreciation. There is no time. Climate change cannot exist only as a subject for discussion, but as a topic for action. Because the devastation of climate change has already begun, and we must act. Together. “We need to reclaim the ideal of ‘the commons’ and reject the prioritization of technological and economic fixes.” This quote by Ruth Nyambura, an Eco-feminist and activist from Kenya, was one of the many that I have messily scrawled in my notebook from the Women’s Earth and Climate Action Network (WECAN) event, ‘Women Leading Solutions on the Frontlines of Climate Change’ — a side event at the UN Climate Conference COP23. Throughout the course of this session I felt empowered, inspired, and angry. However, Nyambura’s sentiments capture the essence of what I took from the event. When working towards climate change solutions, it is clear that we need to fundamentally change the way that we consume and interact with our environment. This is overwhelming and sometimes feels scary, if not impossible. Personally, I have always understood access to a clean and healthy environment as the fundamental human right upon which the realization of all other rights relies. What Nyambura gets at is the idea that if we are not spiritually connected to our environment, and by proxy the other actors that exist within it (both human and non-human) we will never be able to address the overwhelmingly complex issue of climate change. Speakers at the Women’s Earth and Climate Action Network (WECAN) event, ‘Women Leading Solutions on the Frontlines of Climate Change. Photo taken by Sarah Munro. The fact of the matter is that the people who are disproportionally impacted by climate change-related issues like flooding and drought (and the subsequent shortages of food, water and shelter) are not the primary ones contributing to antecedents of climate change, like over-consumption of animal products, food waste, and fossil fuel emissions, among others. Many of the most-impacted people include women, such as Nina Gualinga, the Kichwa leader from the Pueblo of Sarayaku, Ecuador, who is working to preserve the Amazon rainforest, and Thilmeeza Hussein, founder of the NGO Voice of Women and former resident of the Maldives. As I listened to Gualinga and Hussain talk about defining ‘development’ in a way that empowers those in countries that are developing and the negligence of those pushing to continue the use of fossil fuels (including the United States’ heartily-protested COP23 presentation on “clean coal” – are you kidding me?) I became angrier and angrier that this incredible WECAN conference was merely a ‘side event.’ Meanwhile, those with the the highest clearance, those with the most policy-making power were sitting at the main COP venues listening to a panel of environmental injustice perpetrators, like Shell, discuss alternative energy. When Gualinga asked the question, “who is defining development?” she is addressing the fact that voices like hers aren’t at the table with corporations like Shell. The people whose lives depend on the preservation of diverse ecosystems are not at the table. The people whose employers have caused and perpetuated climate change related disasters are. There are a lot of reasons for this. I would argue that one of the most prominent ones is the fear among those in power that their power will be dismantled or changed in some fundamental way. Perhaps after decades of disenfranchising indigenous people in the Global South, these policy makers and corporations have had a moment of reflection — where they realized that what they did was wrong and that the process of making amends and distributing appropriate reparations will be painful and time consuming but necessary. Essentially, I think that the persistence of unequal power dynamics stems from our lack of a spiritual connection to our environment and each other. And our inability to form this connection has the direct consequence of maintaining institutionalized inequality and a western capitalist culture of consumption. It is problematic that corporations are so highly valued as change-makers, when by definition, the mission of a corporation is to increase their profits. Especially in America, where private corporations are not subject to the same level anti-discrimination rules as the public sector. Furthermore, while not all governments represent their constituents well, their chief role, unlike businesses, is to represent the best interests of their constituents. Businesses (perhaps with the exception of B-Corps) hold a fiduciary responsibility to maximize the profits of their stakeholders, who often represent the world’s elite. This, to me, is completely inconsistent with the core values of social and environmental justice — to attain a sustainable network of systems that are healthy, equitable, and compassionate. 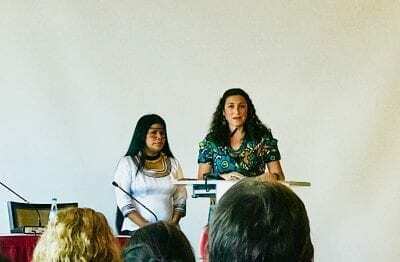 Womens Earth and Climate Action Network Event at COP 23. This is not to say that corporations cannot use their profitability to effect positive social and environmental change. We should just be skeptical of their willingness to do this effectively — especially when promises of corporate responsibility are proven to serve as effective marketing. Even in the panels I’ve attended discussing the virtues of corporate social responsibility, corporate leaders are incredibly transparent in discussing social and environmental impact as fiscally beneficial — rarely addressing the fact that we should just be kind to others. We just should. 80% of climate refugees are women and children. In Africa, although 80% of food is produced by women, 22 out of every 25 women live in poverty. During times of food and water shortage, which are expected to increase as climate change becomes more severe, women are more likely to go without food and die from starvation. So when female climate leaders like Hussain call out the negligence of industrialized countries as a “climate genocide by corporate greed,” why isn’t everyone there to listen? “Women’s movements have always been in the business of territories — be it bodies, communities or the world,” said Noelene Nabulivou of DIVA for Equality and the Pacific Islands Climate Action Network, Fiji. 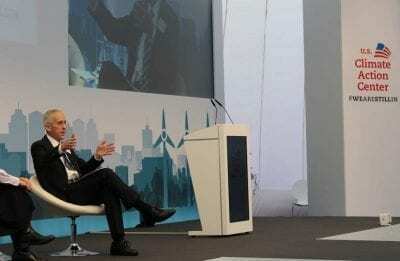 I will reiterate Nabulivou’s call to action because I think it is empowering and will inspire self-reflection. We are not all in this together. Climate change affects everyone, but people of color and women are impacted disproportionately. Failing to address climate change related disaster is a tool for maintaining institutionalized racism and sexism. We need diverse bodies participating in climate negotiations. We need to mainstream the tenets of intersectional feminism into climate policy because intersectional feminism is inherently related to the power dynamics. A favorite quote of mine by Audre Lorde is, “It is not our differences that divide us. It is our inability to recognize, accept, and celebrate those differences.” It is the responsibility of our leaders to mainstream gender in climate policy. It is the responsibility of those in power to self-reflect on their bias. Negligence to do so perpetuates systematic sexism and racism. Our identities are multifaceted and they intersect. And if there was anything that I took from WECAN’s event, it is that each of us has solutions. Those of us who have experienced institutionalized violence are often the most creative. And so, as stewards of the environments we occupy, it is our responsibility to use the privilege we do have to speak up. On Monday, November 13th, UConn@COP23 attended an event at the conference called Women Leading Solutions on the Front Lines of Climate Change. 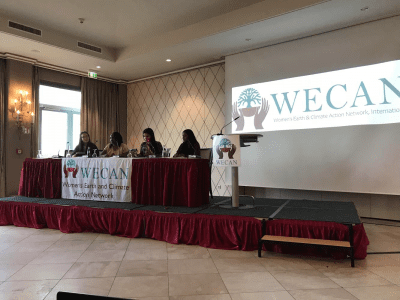 The event was organized and hosted by WECAN, the Women’s Earth & Climate Action Network, International. 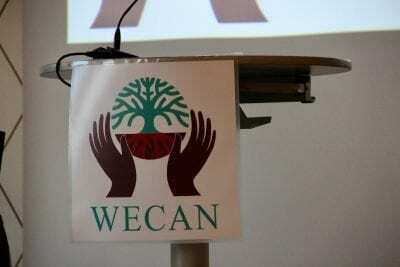 WECAN is a climate justice-based initiative established to unite women worldwide as powerful in worldwide movement building for social and ecologic justice. The event took place at the beautifully eloquent, Hotel Königshof, located right on the Rhine River in the city of Bonn. The hotel had a very vintage-chic-feminine vibe which created the perfect back drop for the event. Upon entering the space, one could truly feel the room radiating with warmth and life. Imagine a room filled with passionate women from a diverse array of countries, communities, cultures, and identities from all around the globe. It was so refreshing to be in a space filled with such richness and color. Our group stayed for three of the events panels and keynote speakers; each panel consisting of talks done by a composition of four very wise and experienced environmental activists. This was well executed, as the purpose of the event was to unite women from all different walks of life to join in solidarity and speak out against environmental and social injustice as well as to draw attention to the root causes of the climate crisis. Addressing the root causes of this crisis and having discussions about racial and gender injustices is a form of resistance, and it should be given a lot of credit, as it takes courage to be disruptive and to revolutionize the way we talk about the environment. This was especially true in the context of the mainly white male cisgender dominated 23rd Conference of Parties, where the “main events” were often very superficial and non-substantive. Present in the very tone and essence of all of the talks was the idea that this issue of climate change and environmental degradation would not be solved until women, especially brown and black women, are given a seat at the forefront of decision making table. 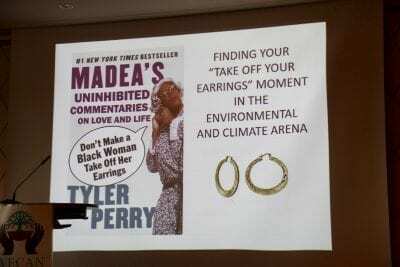 “Don’t make a black woman take off her earrings” a metaphor for action in the environmental movement, inspired by panelist Katherine England. I greatly appreciated the unique way this event united a group of women, who were all so different in so many ways, around a common cause. Women who had a diversity of experiences: coming from different places, celebrating different cultures and religions, speaking different languages, and in turn, who face different struggles. And yet, even though this theme of unity was present, it did not erase or diminish any of the women’s identities — but instead maintained that fine balance by celebrating those differences at the same time. There was spoken word, poetry, different languages being spoken (and translated), and even an indigenous women’s warrior song, all used to conveyed the experiences and witnesses these women had to the effects of climate change. The event was so uplifting, and inspiring for many, if not all, of the women in the room. Our anger and frustration with current state of the world was not only validated, but re-inspired which does not happen often. A flame was lit underneath my passion and drive, and to use the words of our speakers, Katherine England, I felt my earrings literally fall off. This “side event” at COP23 was an experience that I will cherish for the rest of my life. Warning! Climate change is real and affects millions of people around the globe every day. The longer nations wait to take action the more perilous these impacts are expected to become. More importantly, the people who have contributed the least to climate change will be the ones to face the brunt of it first. Drought, infectious diseases, hunger, and displacement are all disproportionately impacting women and people who are living in less developed countries. Additionally there are islands in the Pacific that have already been lost due to the rising sea level. At the Women’s Earth & Climate Action Network conference, Thelmeeza Hussain from the Maldives reported that her home is subjected to saltwater intrusion. This has led to a loss of drinkable water, destruction of agricultural lands from sea salt, coral reefs dead and bleached white or in the process of dying, and an increasing frequency of dangerous king tides. These impacts are not a product of the actions of the people of the Maldives, yet they are unfairly affected by the fossil fuel businesses and consumption in developed countries, who continue bad practices despite knowledge of climate change. Real change starts with opening up the floor to their voices, listening, then implementing the policies that were chosen by them for their communities. Thank you, Fiji and Germany, for hosting COP23 and empowering voices that otherwise may have been lost in the conversation. I look forward to raising awareness back at the UConn Avery Point Campus and elsewhere about issues like the role of gender in climate change and the social injustices of loss and damage already incurred from its effects. 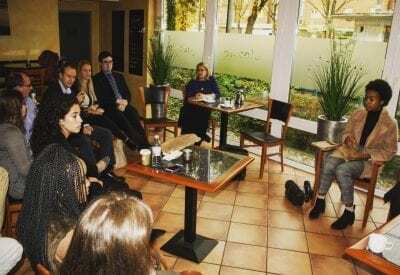 One staple of our UConn@COP23 week was the ‘Breakfast Club,’ where the group gathered each morning for a faculty-led discussion about a climate change-related topic and to share thoughts about our experiences from COP-related events of the previous day. As a senior majoring in Human Rights, I have principally been exposed to social justice narratives and it was constructive to hear voices from students majoring in Chemistry, Engineering, Business, Environmental Sciences, Geography and Environmental Studies. The students were at many times split between those studying humanities and those in STEM, challenging norms accepted in both fields. Should we be talking about racism when we talk about climate change? Should pragmatic science-driven solutions be given preference even if they discount or perpetuate discriminatory effects? In my Human Rights classes, climate change conversation has always gone hand-in-hand with analysis of environmental injustices. My courses focus on issues like racialized housing policies in Flint, Michigan, or violations of indigenous rights like the Dakota Access Pipeline. Discussions are often people-centric and use rights-claiming language. Everyone has the right to clean water; everyone has the right to life, to an attainable standard of health, to nondiscrimination. However, this conception of climate change can be limiting and is often dismissed in countries where such norms do not hold much authority. On the other hand, I have recognized that exclusively human rights-driven narratives are not sufficient for addressing existential environmental threats, like climate change, which demand immediate, radical action from the global community. It is infinitely easier to demand reduced CO2 emissions than it is to demand the destruction of the patriarchy. Science-based targets and emission thresholds provide states and private actors with clear goals and limits that are accessible and attainable. Unfortunately, international environmental agreements, like the Paris Accord, hold no definitive binding power, and are only as effective as the ensuing commitments made and actions taken by each nation. One thing that has been made very clear to me by my COP23 experience is that climate dialogues are often exclusive spaces. They are white spaces, they are Western spaces, and they are male spaces. There’s a push to highlight SIDS (Small Island Developing States), to include gender analysis, to incorporate social justice. But these efforts have brought us panels with token minorities and corporate leaders who are applauded for green-washed diversity programs. Climate dialogue needs to emphasize diverse and nondiscriminatory leadership if it wants to correct the issues that caused climate change in the first place. UConn@COP daily Breakfast Club meeting. Photo taken by Mark Urban. The UConn@COP ‘Breakfast Club’ discussions raised many of these issues. Deliberating back and forth with a diverse group of UConn students about climate change priorities has reaffirmed my belief in multi-dimensional dialogue. Social justice and science driven solutions to climate change do not have to be and are not mutually exclusive. Science-driven policies can ignore systematic inequalities and exacerbate them in proposed solutions. Social justice claims can be disconnected from the capacity of governments and constraints in the private sector. The key is striking a balance between these two narratives without excluding or marginalizing voices that should be playing main roles. Our daily ‘Breakfast Club’ discussions pushed me to think more broadly and creatively about climate solutions. For every UConn class talking about environmental discrimination, there is one talking about habitat evolution, and another talking about corporate social and environmental responsibility. My experience at COP23 has reassured me that it is vital to bridge this divide and engage in inclusive climate discussions. Without leadership from diverse narratives, both scientific and humanitarian, our planet won’t stand a chance against climate change. …Second Nature has led higher ed’s involvement in We Are Still In (WASI) from the outset and we helped coordinate the sector’s involvement in the US Climate Action Center. We had presidents and faculty involved in panels at the Center and co-hosted a reception there with AASHE, Tufts, and UConn, which had a great turnout. It was wonderful to see US higher education so well-represented and we heard from many other countries how encouraged they were by the US Climate Action Center! As we all trickle back stateside from Bonn…there is a lot of interest from across the US in exploring ways higher education can accelerate cross-sector (not simply internal) climate solutions as part of the aligned work of WASI coming out of the COP. This has the potential to not just accelerate your own goals, but also meet the broad social needs as well. As one colleague from WWF put it – WASI may act best as a traffic cop who makes sure all the lights stay green! Additional blogs describing the cohort’s experiences at COP 23 will be posted throughout the next few weeks. With the United States federal government clearly choosing to stand on the sidelines in the fight against climate change, it is more important than ever for sub-national entities to step into the ring. Since the Trump administration made the highly-contested decision to pull out of the Paris Agreement in June 2017, many state and local governments, activist groups, businesses, and universities have stepped up to the challenge and have already begun to prove that they can fight against climate change and yield clear results, with no need for assistance or support by the federal government. The necessity of sub-national action has been reinforced many times over at the COP23 UN Climate Change Conference in Bonn, Germany. In her opening remarks at the U.S. Business Showcase in the U.S. Climate Action Center, Sheila Bonini (Senior VP, Private Sector Engagement, World Wildlife Fund) asserted that “when the government does less, we need to do more.” In this case, We encompasses everyone from sub-national governments to activist organizations; from businesses to universities to citizens across the country. Already, over 400 cities have pledged to cut pollution, and over 600 universities have committed to eliminate their carbon pollution within a certain number of years. 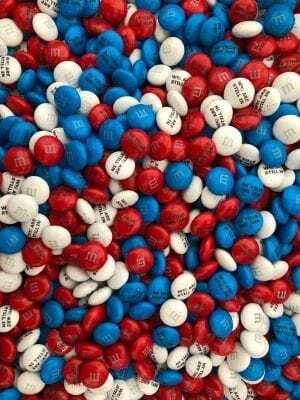 We Are Still In M&Ms from Mars, Inc. Businesses have also addressed the issue of climate change, with countless corporations adopting sustainable business plans to reduce their emissions. 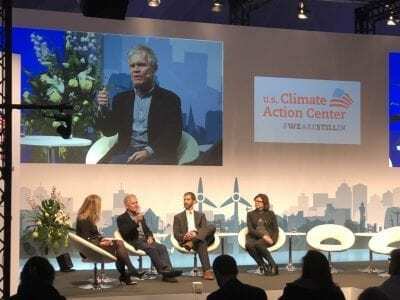 Mars, Inc. had a large presence at the COP23 conference in the U.S. Climate Action Center, where they shared their impressive plans to decrease their carbon footprint. They also handed out M&Ms printed with the slogan We Are Still In. Oregon governor, Kate Brown, also instilled the importance of sub-national governments in the fight against climate change. Governor Brown spoke at the U.S. Governors’ Panel in the U.S Climate Action Center, where she discussed the imperative action required by state governments in order to meet the targets stated in the Paris Agreement. Despite the complete disregard of climate change by the federal government, not all hope is lost. Sub-national entities have proven that the U.S. still has a strong commitment to the environment, and although there is still so much work to be done, I feel like I can let out a small sigh of relief because of the commitment to continue striving towards future goals. Trump may have pulled out of Paris, but sub-national entities, including the University of Connecticut, promise that #wearestillin. In every single panel, there has been one common thread: hope. It was definitely not a theme that I expected, here at the first Conference of Parties since Trump’s announcement of the United States’ withdrawal from the Paris Agreement. But through the responses of groups around the world, it was clear that many within the US are not giving up on climate action, but rather pushing forward more than ever before. Through the events of the past few days, we have seen the representation of many interests. We have seen overtly anti-capitalist NGO leaders represented at the women’s panel, telling us how their lives and communities have been directly impacted by the horrifying realities of extreme weather events and sea level rise. We have seen sustainability leaders from companies including Microsoft, HP, and Bank of America, talking about the importance of sustainability measures and closed-loop systems to maximizing profits. We have seen state governors and environmental leaders, stressing the importance of sub-national regulations and new innovations in ensuring the protection of the forests that help to soak up atmospheric CO2. And we have even seen professors and climate change leaders from some of the United States’ top research institutions, working relentlessly towards meaningful results and the dissemination of these results to policymakers throughout the nation. While these varied parties certainly have different motives for working towards solving the worldwide problem of climate change, they did not feel defeated. The NGOs continue to solve environmental problems from a grassroots level, and the businesspeople agreed that Trump’s decisions on the Paris Agreement had no impact on their sustainability progress whatsoever. Likewise, many influential states have committed to the We Are Still In movement, and universities across the states continue to churn out climate data and educated young people with the support of their schools. The United States is sending a clear message to the Trump administration and the rest of the world: we will not fall behind, and we will not let the decisions of one individual overpower the leadership at many sub-national levels. In addition to mitigation and adaptation, the two commonly heard terms when discussing how to address climate change, there is a third category called “loss and damage”. I first learned about this concept earlier this week during our daily breakfast club meetings where we discuss topics from various events that we attended the previous day. Loss and damage refers to the effects associated with climate change that cannot be prevented via mitigation or accounted for through adaptive measures. The fact that Entire Small Island Developing States will soon disappear under the rising seas is a prime example of such loss and damage that at a certain point become too much to cope with. We also got the chance to attend a screening of the introduction to The Age of Consequences followed by a discussion with the filmmaker, Jared P. Scott, and several other figures who work in the national security arena. While listening to the speakers, I couldn’t help but contemplate the question that I have been presented with in the past: Where is the balance between providing international aid and empowering the receiving country to attain long term sustainability on their own? In other words, when do foreign humanitarian efforts begin to undermine a nation’s ability to thrive under their own leadership? This is an important question when contemplating how climate change exacerbates problems in context of national security because while simply giving money is politically appealing, it may not necessarily be the most effective method, and may even serve as counterproductive to the end goal. In order to not propagate the destructive narrative that people from developing countries are helpless, one must be careful to not take the movie at face value, which may make it possible to mistake climate victims (in the form of refugees for example) as security threats. But rather quite the opposite is true because these “victims” are actually a uniquely vulnerable population that has the ability to offer real solutions to the problem that they have dealt with for years. We had the privilege of hearing testimonies of women on the frontlines from places that have been directly affected by climate chance such as the Maldives, Kenya, and Ecuador. Listening to the impressive and awe-inspiring speakers at the Women’s Earth and Climate Action Network Event is something I will never forget. 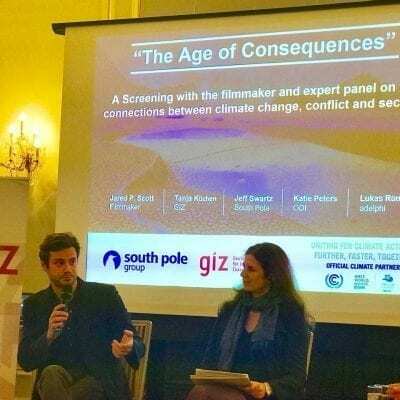 I was excited to attend a special 30-minute screening of the new climate change documentary, the Age of Consequences, which was held in an over-flowing ~150 person lecture hall at Bonn University. 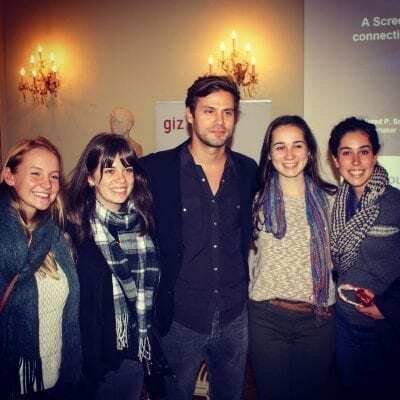 The film was followed by a panel discussion featuring the award-winning filmmaker/director, Jared P. Scott, along with various representatives from German-based academic institutes and international sustainable development companies: Tanja Kuchen (GIZ), Katie Peters (ODI), and Lukas Ruttinger (Adelphi). 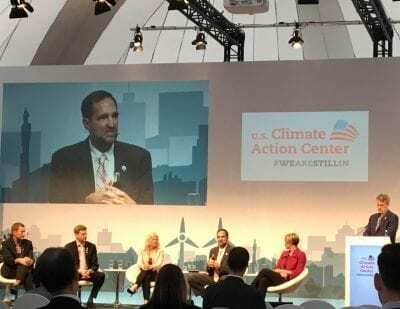 The panel was moderated by Jeff Swartz, a representative from a German emissions reduction consulting firm (South Pole Group), who thankfully announced that the program would be presented in English. National security is one of the few bipartisan issues in the United States, and was considered a high priority by 80% of American citizens polled during the 2016 election (Pew Research Center). On the other hand, climate change has become increasingly politicized by climate-denying conservatives on the right and climate activist progressives on the left. The Age of Consequences attempts to bridge this ideological divide by presenting national security and global warming as interdependent. The movie aspires to persuade conservatives to appreciate the nexus between the effects of climate change and the consequences of global instability, poverty, hunger, and displacement of populations, ultimately leading to terrorism and war. Interviews with Sherri W. Goodman (Center for Naval Analyses), Stephen A. Cheney (retired U.S. Marine Corps Brigadier General), and David Titley (U.S. Navy Admiral) demonstrated how top military officials and analysts regarded the importance of climate change as a real and significant threat to national security. the United States who typically do not prioritize global warming, but are part of that 80% who recognize the importance of national security. Having grown up in a conservative-majority town in western Connecticut, this felt like the answer to the argument I’ve been having most of my life – climate change is a very serious threat, and one’s political orientation shouldn’t change that. My second reaction was only realized as I listened to the way the panel members were addressing the audience. In all likelihood, the UConn group members were the only U.S. citizens in attendance, besides Jared P. Scott himself. Although all of his responses were eventually comprehensive, he sometimes hesitated, and even struggled, as he attempted to explain the varied and conflicting priorities that Americans tend to have. No doubt, the film will draw controversy back home. But, hopefully, it will also inspire a conversation. We are reaching a point of desperation where we can’t truly combat climate change without having this conversation. Let us know what you think! 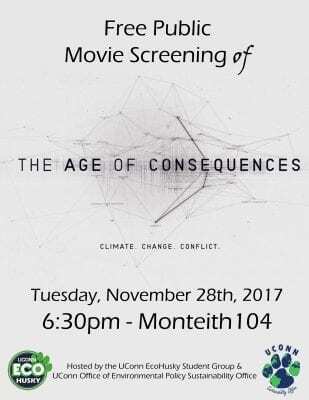 The EcoHusky student group and Office of Environmental Policy will host a viewing of the full-length Age of Consequences documentary on Tuesday, November 28th from 6:30pm to 8:00pm, at Monteith Room 104. All viewpoints are welcome. On the average day, a single student uses a lot of resources; from washing clothes to charging a laptop, the total amassed energy and water-use that the average student accumulates is pretty substantial! Now imagine the combined energy and water usage of the average student and multiply that by the enormity of the average dorm – in which hundreds of students reside. Have you ever spent time thinking about the collective amount of water 700 showers use? Or how much energy hundreds of iPhones utilize within hours? For the residents of Buckley, Shippee, Northwest, East, West, and Towers, achieving this consciousness is what stood in between them and becoming a champion of the 9th annual EcoMadness Competition! 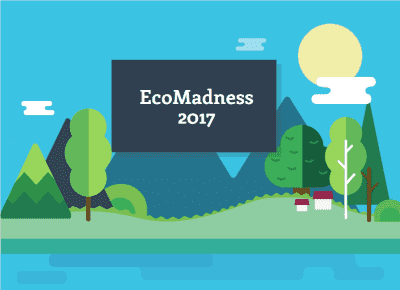 This year’s EcoMadness Competition took place from October 9th to November 6th, during which each involved residency was carefully measured in the following categories: per capita water reduction, per capita energy use reduction, percent water reduction, and percent energy use reduction. After a month of active education, increased environmental awareness, and the encouraging prospect of a free Dairy Bar ice-cream party prize, the results are in! While the winners in each category have been chosen, we would also like to extend our gratitude and congratulations to every student resident involved in the competition. This month showcased an incredible collaborative effort, and could not have been successful without this environmental commitment, and the work of our wonderful EcoCaptains and supportive RA’s! In the coming weeks, the winning dorms should expect a dairy bar ice cream party – free of charge! Though the EcoMadness competition is over, we hope the concepts of water and energy conservation remain a focal point in the culture of each residency hall on campus. Because who knows – maybe a continued sense of awareness will propel a residency hall into a winning category next year! And who doesn’t like free ice cream? This semester, the OEP gained three ambitious, bright, and talented interns: Sophie MacDonald, Jon Ursillo, and Wawa Gatheru. Although they’ve only been a part of our team for a few months, they’ve already made incredible impacts within and outside of the office. Sophie quickly found herself involved in a great number of office initiatives, including the implementation of the new EcoCoin program in the UConn Bookstore, rating offices throughout the university on their sustainability efforts as part of the Green Office Certification Program, and working on our Tree Campus application. She is also the creative designer of our new OEP Sustainability Office logo! When she’s not busy in the office or balancing her demanding Mechanical Engineering course load, Sophie is involved in both Engineers Without Borders and the Hibernation Team for Ethiopia. She loves being outdoors, whether it be hiking, birding, or traveling to national parks. Fun fact: this summer, Sophie will be travelling to Machu Picchu to hike with UConn Choose a Challenge! 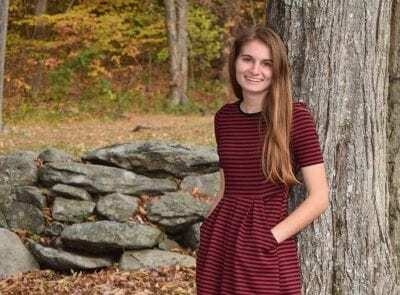 She is also the second high school valedictorian on the OEP’s current intern team, graduating top of her class at Litchfield High School in 2016. She joins Christen, who held that honor for the 2014 graduating class at Hampton Bays High School, in New York. 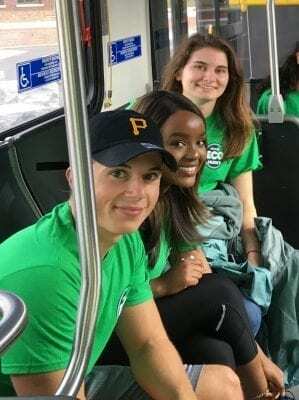 Prior to interning at the OEP, Jon was selected to be a facilitator for the honors UNIV course in Environmental Sustainability, where he was first able to connect his appreciation of the environment to university sustainability. His enthusiasm and achievements in this setting have translated immensely during his time in the office, during which he has already begun working closely with Facilities Operations to update and homogenize recycling throughout our campus. In addition, he has played important roles in the organization and success of our Football Green Game Day and EcoMadness events. 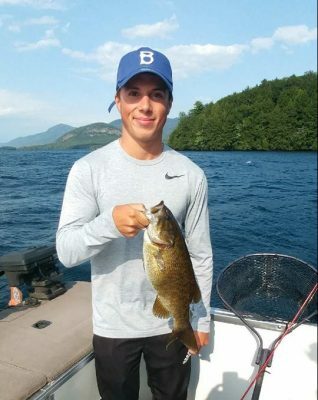 Jon’s interest in environmental sustainability extends far beyond the OEP, as he is a double major in Environmental Sciences and Economics, and an involved member of the Sea Run Brook Trout Coalition and the Protect Rhode Island Brook Trout organization. His appreciation of the environment stems from his love of all things outdoors, including hiking, fishing, and skiing. Also a brother of the Zeta Beta Tau Fraternity, Jon continues to pursue leadership and service in the UConn community. 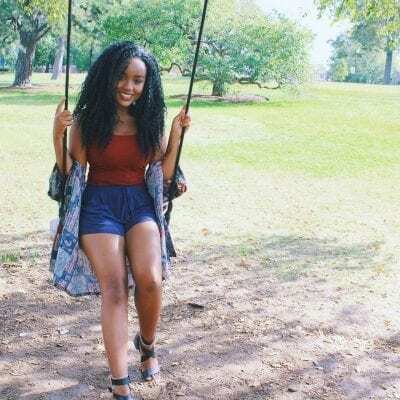 Our final intern, Wawa, has brought a wealth of experience and ambition to the OEP, with an endless list of leadership roles and involvement in campus initiatives. These include her positions as USG Student Services Chairwoman, Research Assistant in the Nutrition Department, SOS Food Recovery Volunteer, Cross Cultural Connections Partner, former HuskyNutrition student coordinator, and FYE Mentor for Global House. She also serves on the Dean of Students Advisory Board, Chief Diversity Officer Student Advisory Board, and the Courses and Curricula University Senate Sub-Committee. She even helped to spearhead the campus ‘ban the bottle’ initiative, and has been a strong advocate for the Sustainability General Education Requirement. During her time at the OEP, Wawa has dedicated herself to social media outreach and blog writing, as well as offering immense support with EcoMadness event organization and the Green Office Certification Program. She is a strong believer that the environment plays a fundamental role in every aspect of life, and it is clear that Wawa has integrated this passion into each of her endeavors. As an Applied and Resource Economics major fluent in three languages, with Kenyan heritage and over a year spent in Thailand, we foresee Wawa having a lasting impact on environmental sustainability, both at UConn and globally.